Every business has a great story behind it, no matter how big or small, and in today’s digital age, it’s getting harder and harder for businesses to thrive without being online. Have you ever heard about a burger joint or a small retail store, but have never been able to find it online? I have, and I’ve eventually forgotten a few simply because I couldn’t bookmark their websites. 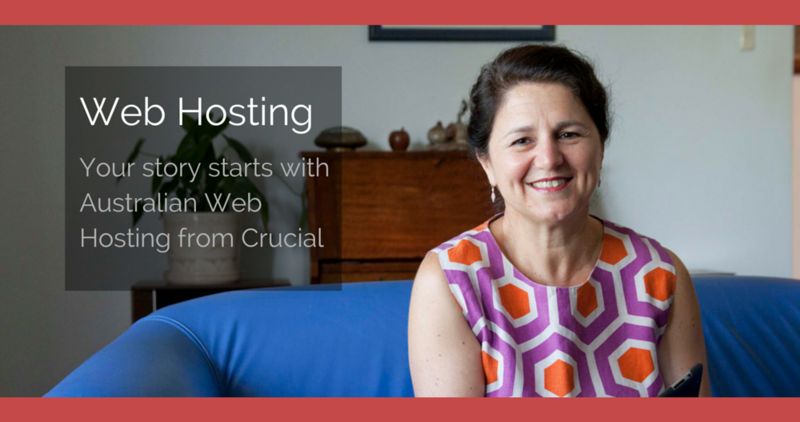 It’s time to get your story online and make an imprint on the social world of the Internet, and Crucial’s Web Hosting service will have you at hello. Web hosting is a service that puts your website online, connecting it to the Internet and making it accessible from anywhere and at any time. In its basics, purchasing a web hosting service means that you’re purchasing a small chunk of the Internet to use for yourself — that small chunk is physically a small space on a server in a data centre (the large facilities that store thousands of servers). You can use that space for whatever your online desires are. Startups – Launching your dream website is just a few clicks away. So, you’ve got an idea or business concept and want to get it online and see what goes from there — that’s the hardest part, yet it’s so easy. Once you’ve got one of our Web Hosting packages, all you’ll need to do is design your website, and you’re on your way to new heights! Small Businesses – If you’ve already launched your dream idea and your small business is thriving, then you’re half-way to a steady success. Getting your small business online is one of the most important aspects of a modern business today, and it’s one of the most satisfying decisions that you’ll make. For every customer that walks into your store, there are at least five more online customers that would want to. Add up the figures and you can see that there is a lot more going for your small business online. Entrepreneurs – So, you don’t have a single small business, but many. Web Hosting is the right place to be. Getting those businesses online is a crucial action and a cornerstone for your success. With 50GB of storage and 24x7x365 live support, you’ll feel right at home (well, basically you can be at home) while managing your businesses with Web Hosting. Bloggers – You may not have an idea or business concept to expand upon, but you do have a brain full of opinions, ideas, and attitudes that you feel the need to share with the online realm, then you’ve come to the right place. Maybe you just want to provide a community forum for something you’re passionate about, whether it’s a local sporting or recreational club, Star Wars or even vegetable-growing. Crucial’s Web Hosting package can get you online smoothly and easily, like taking a candy from a baby. Lots of Storage – We’ve got super fast and super secure storage for your websites and emails — 50GB to be precise. Email – Create as many accounts as you need for you and your team, and with unlimited data transfer, you can enjoy the freedom of transferring data to and from your devices or colleagues. 24x7x365 Live Support – Around the clock support gives you the opportunity to spend less time on hosting, and more on what you’re passionate about. Our Web Hosting experts are always on the line if you need a helping hand. Easy-to-use Control Panel – Our control panel (cPanel) is nothing short of simple and user-friendly — you won’t get lost in the behind-the-scenes complexity of web hosting. The control panel also provides you with silky smooth one-click installation of popular apps (such as WordPress), to enhance your website(s) performance and ensure that you’re getting the most out of your web hosting experience. Extra Features – You’ll be overwhelmed with loads of extra features that reinforce your web hosting service. We’ve got you covered, from automatic backups that keep your data safe and secure to no lock-in contracts (because we know how important flexibility is when running a business). We offset your carbon emissions with Climate Friendly, as well as offer unlimited sub-domains, so you can set up portals or minisites with ease. Added value really does come standard. If you’re looking to launch your dream idea or business, or just want some rock-solid Australian Web Hosting, look no further, our Web Hosting service is all that you will need. Click here for more information about our Web Hosting package, or click here if you would like to explore our fleet of hosting products. OR if you want to watch a one-minute snippet of what our Web Hosting service is all about, visit our YouTube channel here, where you can browse our small library of videos that range from product videos to Connect events.